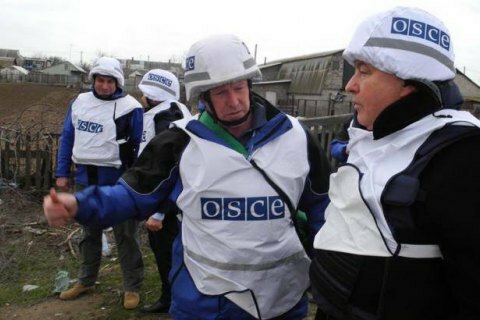 A patrol of the OSCE Special Monitoring Mission (SMM) came under militant fire near Yasunvata, Donetsk Region on 17 March, according to the SMM report. Five SMM members were positioned 15km north of Donetsk on the eastern side of highway H20 to monitor adherence to the ceasefire for demining at and around the Donetsk water filtering station. At 11:45, they heard the hissing sound of a bullet flying above their heads, and at the same time heard a shot of small-arms fire 100-200m south of their position. "All present immediately took cover on the northern side of the SMM vehicles. The SMM assessed the bullet as having been fired from a southerly to a north-north-easterly direction. The SMM also heard another shot of small-arms fire 100-200m south while boarding its vehicles," the report reads. Subsequently all present including the SMM left the area. No injuries to the SMM members or damage to SMM vehicles was sustained.